Well here I am again making another Christmas card ready for December! Wow that's different for me, usually I'm the headless chicken in December lol. The girls over at jinglebellesrock. This fortnight are asking us to Re use, Re cycle or Up cycle whilst we think about Earth Day. So as I always save those card fronts that are too good to hit the rubbish sack I was able to join in with this challenge. I set about using a 6x6 Kraft card blank and covered it with some lovely green dot paper and in the corners I added some gold peel offs and dots of red glitter glue. Then I took a scrap of red check paper by Kaisercraft and added gold straight line peel offs to the edges mounting it on to the card with foam pads. I added cream ribbon to the centre and then the Christmas tree topper on top using Pinflair to lift. I have also used Verve stamps for the sentiments and they have been added to a touch of gold to tie everything together. This card has quite a vintage feel to it and I'm pleased to add it to my stash. Today I'd like to share a card I have made for my husband! As he sees everything I make for others I always feel I need to do something different or over the top for him lol. So using these fabulous papers by Kaisercraft available at merlyimpressions.co.uk which are called mountain-air I set to. Up to last September his main pass time was fishing so when I saw the papers I knew exactly who they would be used for. I have to say I'll be needing different ones for next year because he's taken up something else! But I know he'll still go fishing. 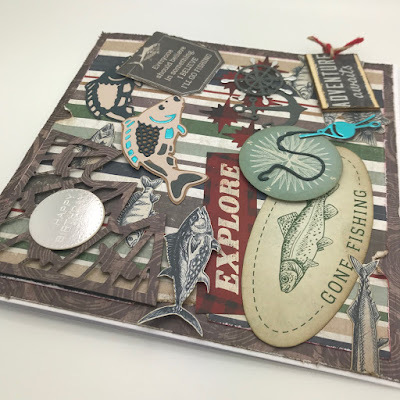 This is a 7x7 tent fold card which I have covered in a wood image paper, distressing all edges, then the stripe paper with more distressing along with a few torn out bits. I used the Tonic corner die with clouds for one corner then I set about fussy cutting lots of elements from one of the papers. 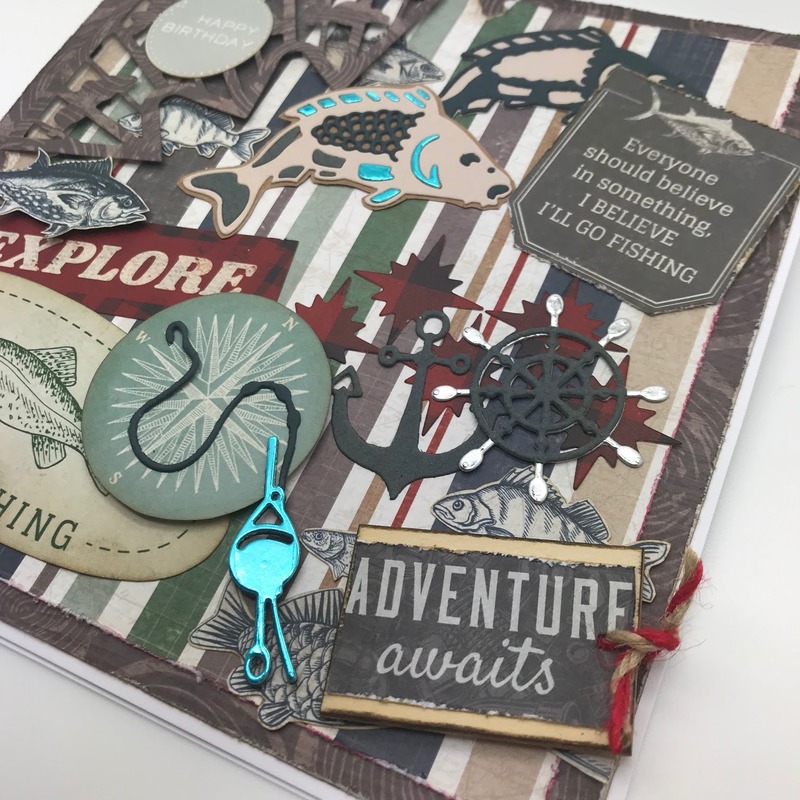 I also die cut a couple of fish paper piecing back in along with a fishing rod and line. I've added a chipboard tag with the sentiment Adventure Awaits. The anchor and boat wheel will become apparent on next years card. Here's a couple of extra photos to give you a different view. You can see all the layers I hope. I just hope he likes it! 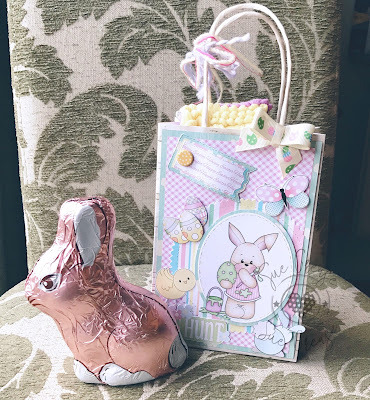 Hello and today being Saturday it marks the start of a new challenge over at Pink Gem Challenge and we are thinking Easter. But we are a Anything Goes Challenge for you. 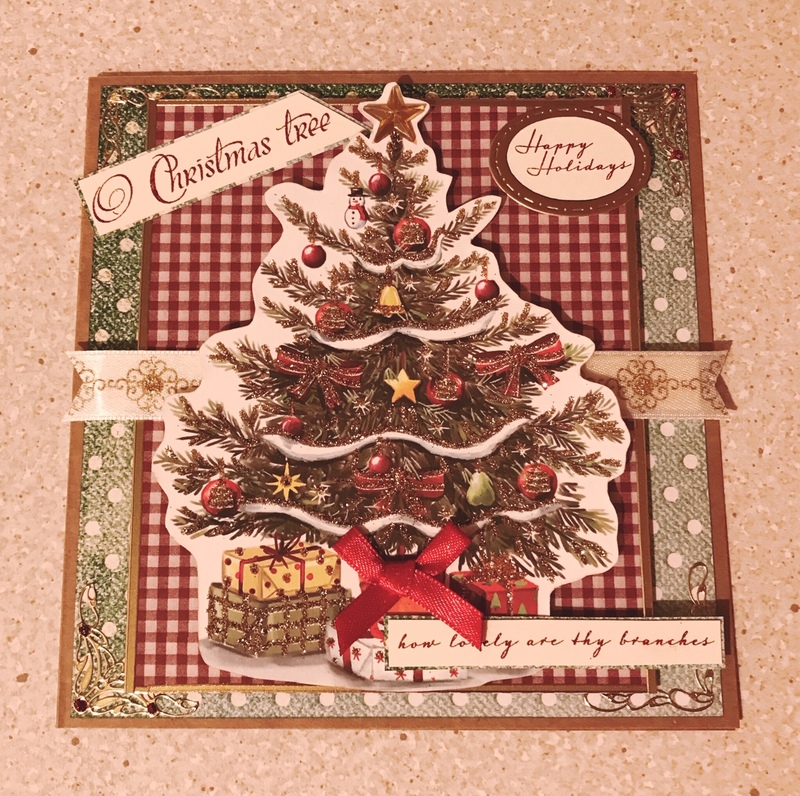 Here is the card I have made using papers and dies from Polkadoodles.co.uk which is where you can find these images too. I am using this cute image called Bunny-with-carrots. I have used my Promarkers to colour him in this time. The base plaid paper I stitched in the corners with green to pull it all together. I'm in love with Nuvo Drops at the moment so a few of them had to be added too. 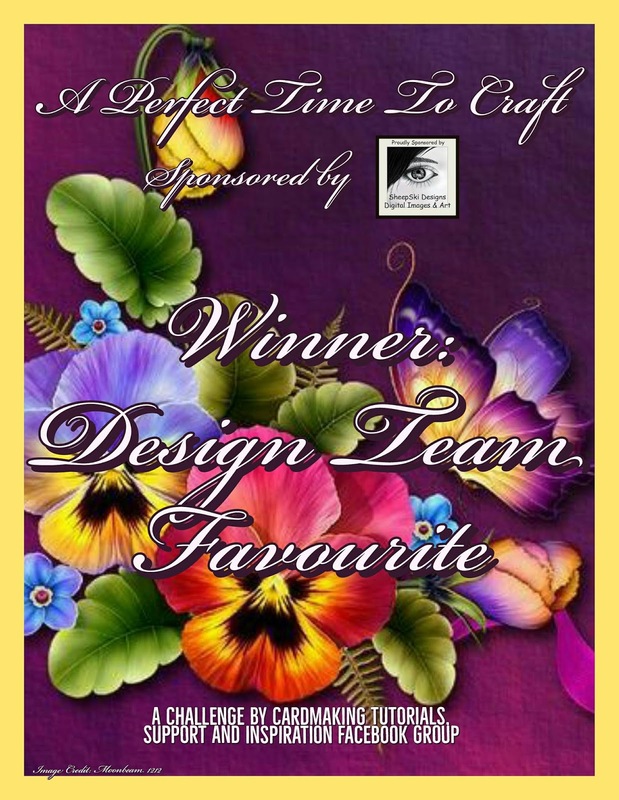 Thanks for stopping by today, this will be my last Design Team post for this team as it's time to move on but do checkout the rest of the team as there are as always some wonderful makes to be seen. The challenge is to add 3 "somethings" to your card and as you can see I've added 3 snowflakes. 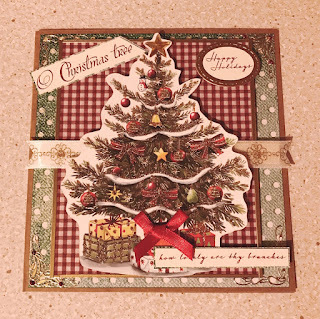 This is a 5x7 card and I have used papers from mint-wishes by kaisercraft found at MerlyImpressions The snowflakes are Spellbinder Dies and to the top I have added chipboard snowflakes. This one will be good for posting as it's not too thick. 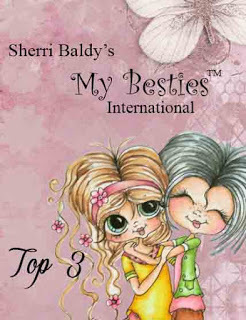 I have a card to share which I have made for the challenge over at jinglebellesrock The theme is to add 3 of something. There is no easy way of taking a photo of this card!! So much gold flashing back at me, so I layed it flat. I am sure you can see what 3 things I added lol. 3 different circles on this 6x6 card. I have stamped off the page with London Fog on a RubberNecker stamp (I've had it years) then added liquid pearls in Rouge, I also added them on the main sentimet circle along with a few dots of gold Stickles. This piece was added to a black mat and lifted with Pinflair. The other 2 mats are layed flat down. The die used for the gold mat is fanciful-circles 6 nested dies from Polkadoodles. 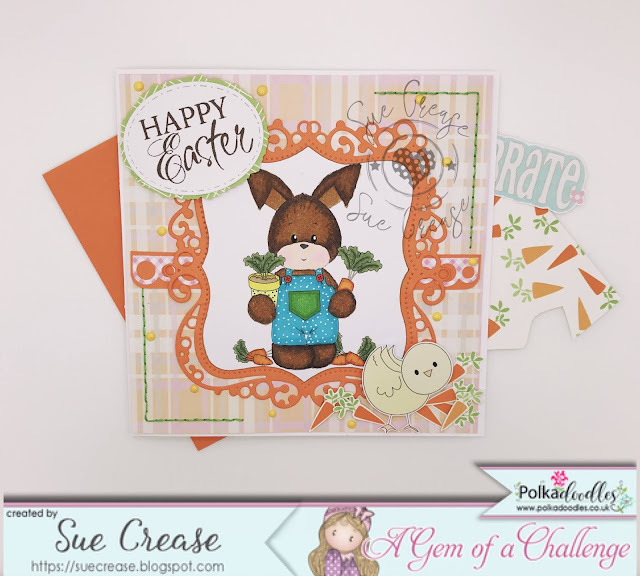 The patterned card and main sentiment are from Buzzcraft. 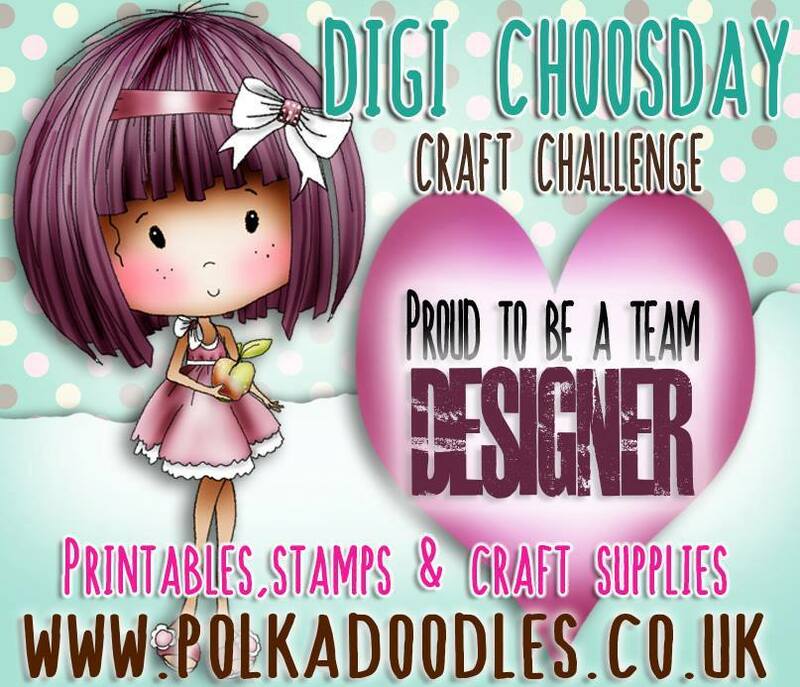 Time for a new challenge to start over at digichoosday and we are using Flowers and Lace on our makes today. But for you guys it is Anything Goes. Today I decided to make a Christmas card. It is never too early to start they tell me! So I have made this lovely fresh card using a 6x6 white card blank and to that I doodled around the edge in a fineline copic in a mauve colour and added the red distress marker. The image is 3 deep in some parts and I added perfect pearls too. The paper, image and sentiment are all found on the winnie-winterland-big-kahuna-digital-craft-download . 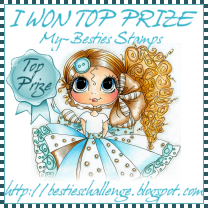 I do hope you can join in with us as there is a great prize to be won. New challenge time over at A Gem of a Challenge and today we are getting ready for Easter/Spring. Now when I was young we always recived new socks at Easter from either Nana or an Auntie as this meant it was time to wear your lighter skirts or even shorts!! Well when you were 6 or so your blood was thicker lol. So I have a cousin who has a little girl and I'd like to carry on the tradition of giving New Bobby Socks at Easter to her too. Well you can't just give them can you? so I made this cute little gift bag. I used this adorable image called bunny-painting Which comes in black and white or pre-coloured which is what I have used here. The bag is 5X7 in size and I have added a heavy paper to it first to steady it to take the rest. 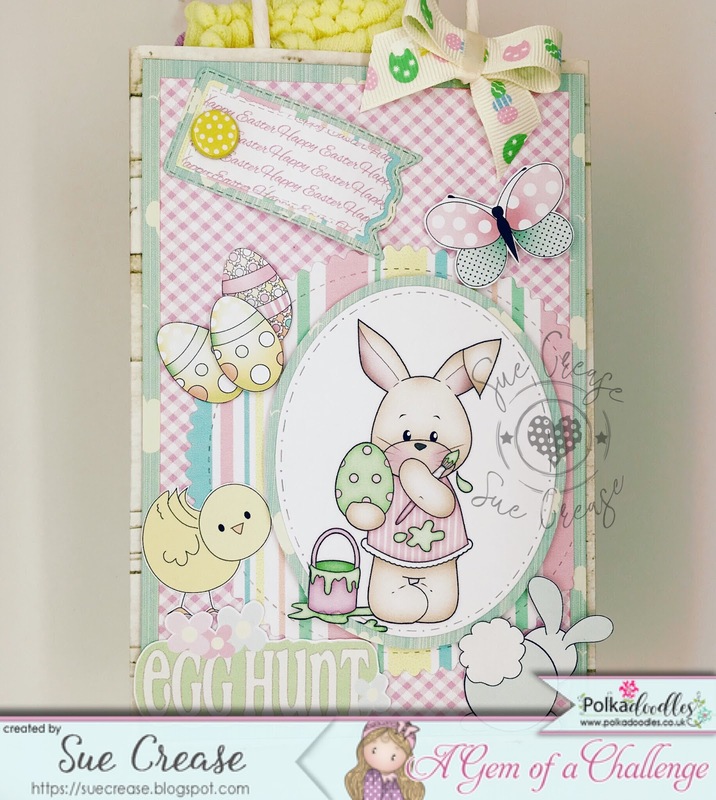 I have used papers from the free-tatty-twinkle-easter-digital-download and images from winnie-sugar-sprinkles-embellies-bundle the sentiment is from winnie-sugar-sprinkles-word-art-bundle I've used foam pads to lift everything . Even though she is not yet 2 a chocolate bunny was required to go along with the socks. Well I'm sure Mum and Dad will help her eat it. Thanks for stopping by today. 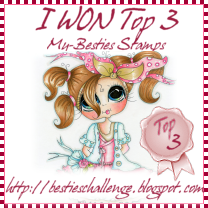 I do hope you will come on over and join in the fun. Hello, I live in Milton Keynes with my husband of 32 years and son. I love crafting and have been doing something for most of my life. My nana tought me to dressmake and then I did cross stitch and then scrapbooking (which I still do) which of course brought me to card making. After family times my next favorite is up in my craft room messing about with paper and card.